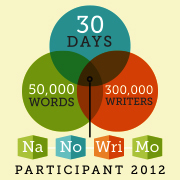 As some of you may know, National Novel Writing Month (NaNoWriMo) will be launching again in just a few short weeks. Last year, I participated in the 50,000-word challenge and won for the first time, though my first time participating was in 2008. This year, I’ll be participating again – but I don’t have high hopes of winning. (Grad school is a bit more pressing at the moment.) While I won’t be posting (or hosting guests) as much as I did last year, you’ll still find a few helpful resources on my site between now and December. I’m aiming to post something each Thursday, starting with a guest post by my friend Elizabeth this week. You can look forward to learning about NaNoPlaMo from her. You can also look forward to some other NaNoWriMo-related goodies, mainly encouraging pep talks and fun/distracting links. For now, tell me a little bit about your NaNoWriMo project. You’ll be learning a bit more about mine when November arrives. It’s the third draft of my first Nano (2010), which is now the first book of a trilogy because I was having so much fun writing about the antagonist. She’s a badass.